The universe is awash with alcohol. Should we be sending ships to collect it? So, there's alcohol in the universe. Have you thought about how it got there? The chemical elements around us reflect the history of the universe and the stars within it. Shortly after the Big Bang, protons were formed throughout the expanding, cooling universe. Protons are the nuclei of hydrogen atoms and building blocks for the nuclei of all the other elements. These have mostly been manufactured since the Big Bang through nuclear reactions in the hot dense cores of stars. Heavier elements such as lead or gold are only fabricated in rare massive stars or incredibly explosive events. 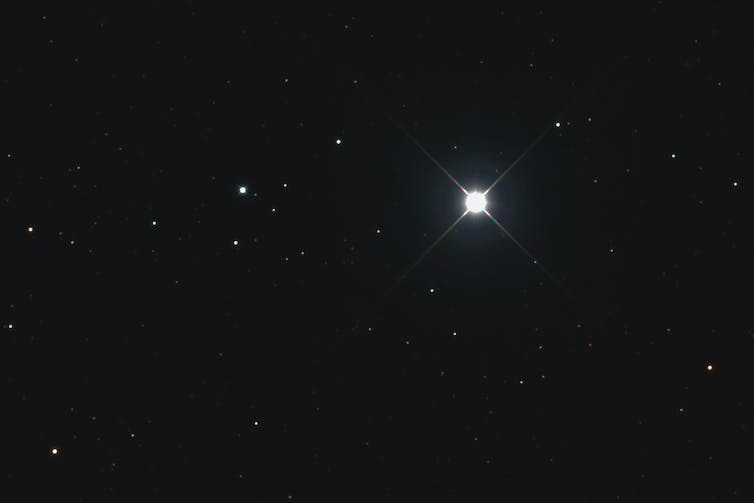 Lighter ones such as carbon and oxygen are synthesised in the life cycles of very many ordinary stars – including our own sun eventually. Like hydrogen, they are among the most common in the universe. In the vast spaces between the stars, typically 88% of atoms are hydrogen, 10% are helium and the remaining 2% are chiefly carbon and oxygen. Which is great news for booze enthusiasts. Each molecule of ethanol, the alcohol that gives us so much pleasure, includes nine atoms: two carbon, one oxygen and six hydrogen. Hence the chemical symbol C₂H₆O. It’s as if the universe turned itself into a monumental distillery on purpose. The spaces between stars are known as the interstellar medium. 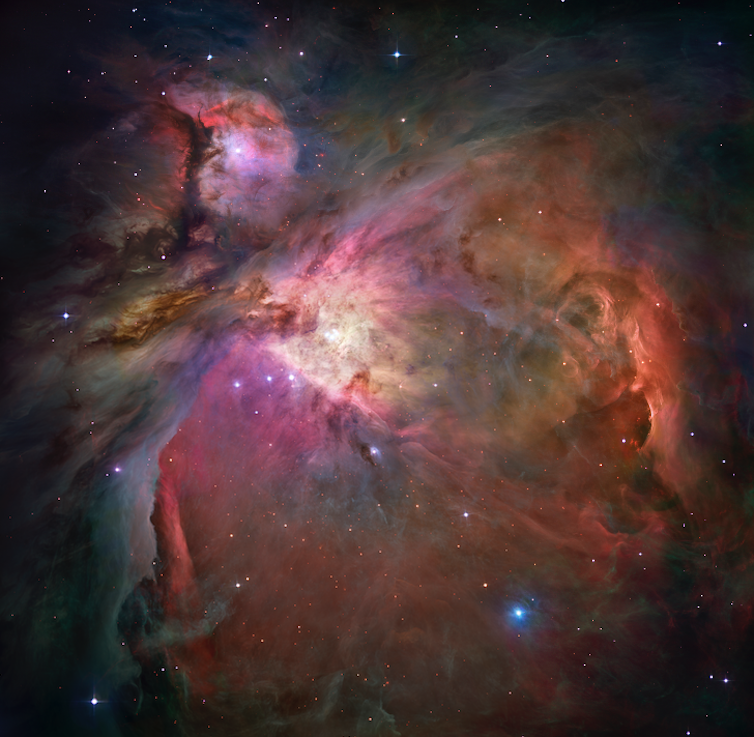 The famous Orion Nebula is perhaps the best known example. It is the closest region of star formation to Earth and visible to the naked eye – albeit still more than 1,300 light years away. Yet while we tend to focus on the colourful parts of nebulae like Orion where stars are emerging, this is not where the alcohol is coming from. Emerging stars produce intense ultraviolet radiation, which destroys nearby molecules and makes it harder for new substances to form. Instead you need to look to the parts of the interstellar medium that appear to astronomers as dark and cloudy, and only dimly illuminated by distant stars. The gas in these spaces is extremely cold, slightly less than -260℃, or about 10℃ above absolute zero. This makes it very sluggish. It is also fantastically widely dispersed. At sea level on Earth, by my calculations there are roughly 3x1025 molecules per cubic metre of air – that’s a three followed by 25 zeros, an enormously huge number. 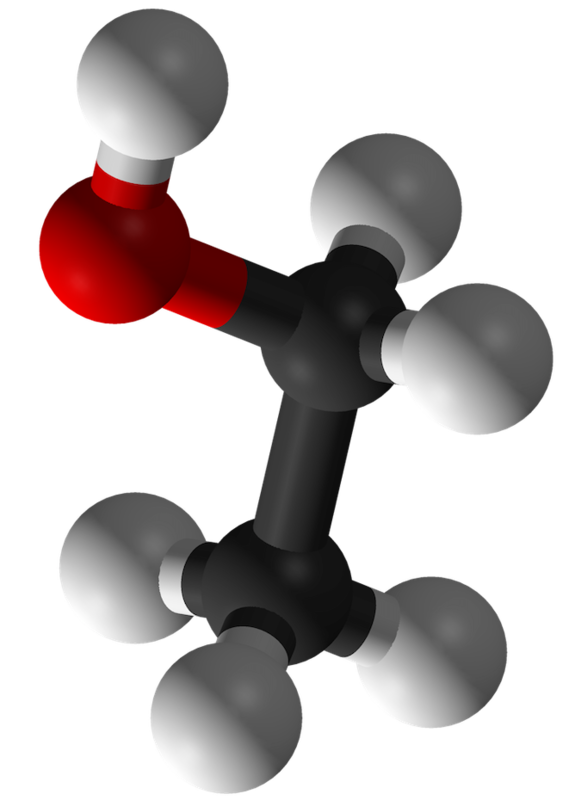 At passenger jet altitude, circa 36,000ft, the density of molecules is about a third of this value – say 1x1025. We would struggle to breathe outside the aircraft, but that’s still quite a lot of gas in absolute terms. Now compare this to the dark parts of the interstellar medium, where there are typically 100,000,000,000 particles per cubic metre, or 1x1011, and often much less than even that. These atoms seldom come close enough to interact. Yet when they do, they can form molecules less prone to being blown apart by further high-speed collisions than when the same thing happens on Earth. If an atom of carbon meets an atom of hydrogen, for instance, they can stick together as a molecule called methylidyne (chemical symbol CH). Methylidyne is highly reactive and so is quickly destroyed on Earth, but it is common in the interstellar medium. Simple molecules like these are more free to encounter other molecules and atoms and slowly build up more complex substances. Sometimes molecules will be destroyed by ultraviolet light from distant stars, but this light can also turn particles into slightly different versions of themselves called ions, thereby slowly expanding the range of molecules that can form. To make a nine-atom molecule such as ethanol in these cool and tenuous conditions might still take an extremely long time – certainly much longer than the seven days you might ferment home brew in the attic, let alone the time it takes to walk to the liquor store. But there is help at hand from other simple organic molecules, which start sticking together to form grains of dust, something like soot. On the surfaces of these grains, chemical reactions take place much more rapidly because the molecules get held in proximity to them. It is therefore cool sooty regions, the potential stellar birthplaces of the future, that encourage complex molecules to appear more quickly. We can tell from the distinctive spectrum lines of different particles in these regions that there is water, carbon dioxide, methane and ammonia – but also plenty of ethanol. Now when I say plenty, you have to bear in mind the vastness of the universe. And we are still only talking about roughly one in every 10m atoms and molecules. 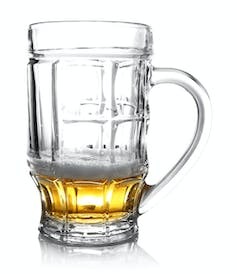 Suppose you could travel through interstellar space holding a pint glass, scooping up only alcohol as you moved. 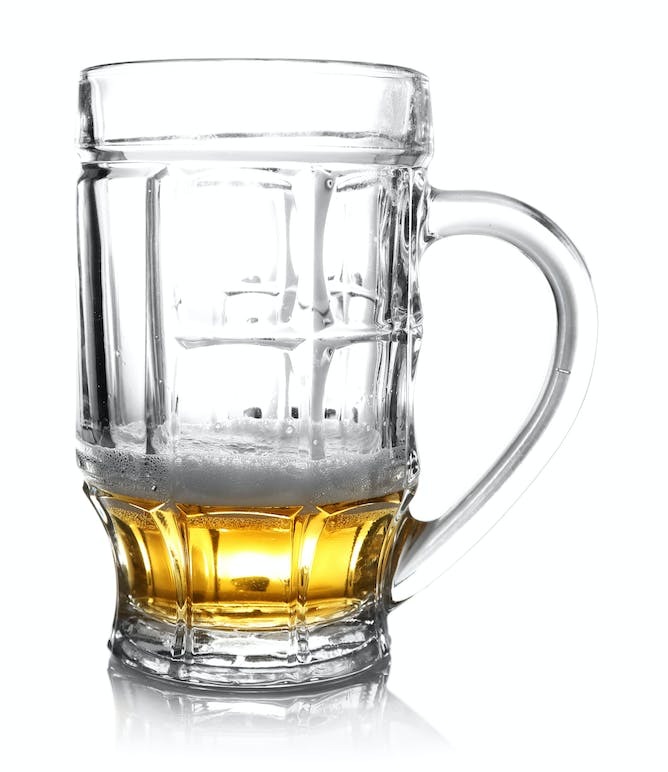 To collect enough for a pint of beer you would have to travel about half a million light years – much further than the size of our Milky Way. 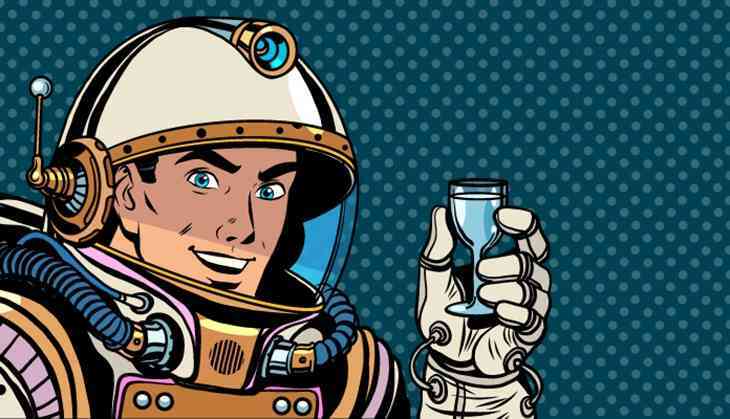 In short, there are mind-bogglingly vast quantities of alcohol in outer space. But since it is dispersed over truly enormous distances, the drinks companies can rest easy. It will be a cold day on the sun before we figure out how to collect any of it, I’m sorry to say. TWEET THIS The universe is awash with alcohol. Should we be sending ships to collect it? So, there's alcohol in the universe. Have you thought about how it got there?